F25 Replacement Filters The popular Honeywell F25 media filter has been replaced by the new Honeywell F100 series media filters. Fortunately, you can use the new replacement filters for the FC100A filter in your old F25 cabinet. F35 and F35R Replacement Filters For those with the obsolete Honeywell F35 Expand A-Pac Filters, you can use the new FC100A filter cartridges F50 and F52 Electronic Air Cleaners If you are tired of cleaning your electronic cells every month, you can easily switch to the replacement media cartridges listed below by turning off the power on the power head, removing the aluminum pre-filter and electronic cells, then installing the matching media filter for your size cabinet. 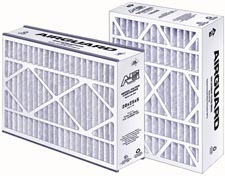 Generic Replacement Options We only offer a high quality generic filter replacement from Air Guard for the Honeywell filters. The cartridges are an exact replacement and require no modifications. The replacement filters are rated at MERV 8.